Dogfish Head Craft Beer Dinner at Franklin! That's Right! Franklin & Company Tavern will be hosting a beer pairing dinner with a selection of I.P.A's from Dogfish Head Brewery and a menu by Franklin & Company Tavern executive Chef Salvador Roldan. Tickets for the event go on sale first to our Punisher's Mug Club © Members and then open to the general public. The event will be four 8oz beer tastings with a four course menu specifically designed for each beer. With beers like 120 Minute IPA brewed to a colossal 45-degree plato, boiled for a full two hours while being continuously hopped with high-alpha American hops, then dry-hopped daily in the fermenter for a month and aged for another month on whole-leaf hops and clocking in at 15-20% ABV and 120 IBUs, 120 Minute is by far the biggest IPA ever brewed! It's easy to see why it's called THE HOLY GRAIL for hopheads! The 120 Minute IPA a few times a year, and goes fast if you live in a state they ship it to which currently California is not one of those lucky states. 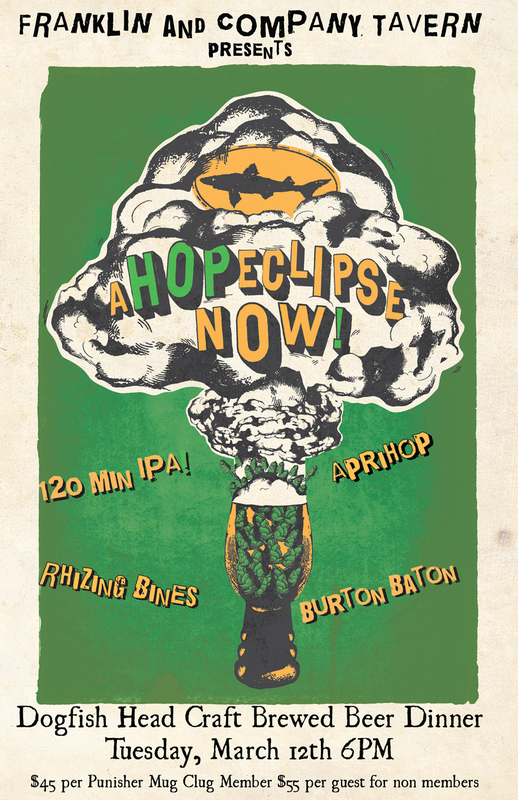 Dogfish Head and Sierra Nevada, two family-owned craft breweries known for their unique hopping techniques, are deepening the bond they forged with the 2009 collaboration Life & Limb.Their new beer, an East-meets-West Imperial IPA called Rhizing Bines, will clock in at 8% ABV and 70 IBUs. This is a limited short supply beer that will disappear quickly! We expect this to be one of our most popular events this year so you got to move fast. Please respond to events@franklinandcotavern.com and a representative will get back to you for booking.